Cylinder head gaskets seal off substances such as coolant, oil or combustion gas in the engine from each other and from the outside. They are exposed to ambient temperatures of up to 300°C and a pressure of up to 200 bars. In the combustion chamber, they can withstand combustion gases with temperatures between 1 800°C and 2 500°C. Cylinder head gaskets of the brand DT® Spare Parts are gas and oil-tight, low-distortion, ductile, coolant-proof, and resistant to the chemical effects of lubricants and coolants. There are various manufacturing methods for cylinder head gaskets. Metal-elastomer compounds are characterised by good separation of the sealing systems from the combustion chamber and fluid channels. The sealing lips made of FPM are elastic and adapt perfectly to the fluid channels. Metal/soft material cylinder head gaskets are composed of a serrated mounting plate with rolled-on layers of soft material on both sides. The combustion chamber passages are fitted with a metal lining. This protects the soft material overlay from the hot gases. A further design type is the metal-layer cylinder head gasket. This multi-layer design consists of spring-steel plates, which are coordinated to the required sealing effect by different formation of the beading. The layers are either designed planar, or partsurface, in order to be resistant to the occurring liquids, gases and temperatures. In order to achieve optimal quality, cylinder head gaskets of the DT® Spare Parts brand are tested for deformation, flow properties, compression, loading, surfacing and adhesion. In the development phase, they are also subjected to a life-test with water, oil and compressed air. Cylinder head gaskets require professional installation. All engine block and cylinder head surfaces must be cleaned and greased must be removed prior to installation. The surfaces of the components must be accurately flat. Basically, it is recommended to replace all cylinder head screws at the same time. Hereby, the specifications of the vehicle manufacturer must be observed at all times. 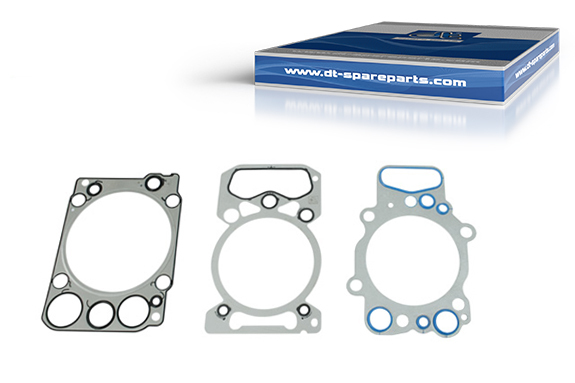 In addition to cylinder head gaskets, DT® Spare Parts offers all standard engine gasket sets, cylinder heads and cylinder head bolts.